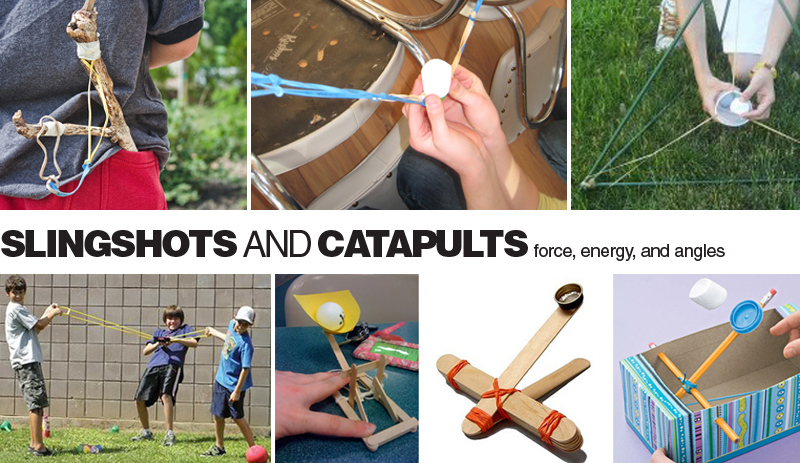 Demonstrate projectile motion, exertion, force, velocity, potential / kinetic energy, and angles with slingshots and catapults! How much force is needed to project objects of different weights? What angle will fly your object the farthest? As a class, or an individual homework project, have kids design a catapult or slingshot. Experiment using different amounts of force. What angle creates the best launch? Try launching objects of different weights. Did heavier objects need more force and require more energy? Measure the distance of the objects you launch! Hand Held Classic Slingshot - The Risky Kids. You can also make a pvc pipe hand held slingshot, click here for instructions! Construct an oversized slingshot for water balloons, balls, toys or anything else you'd like to launch! Visit Instructables, click here and here for two different designs! You can also purchase one from SSWW (featured above). Ping Pong Ball Scoop Catapult, as well as a wide assortment of designs, click here! There are tons of different designs for slingshots and catapults! You can use different components from various designs to create your very own unique launcher!